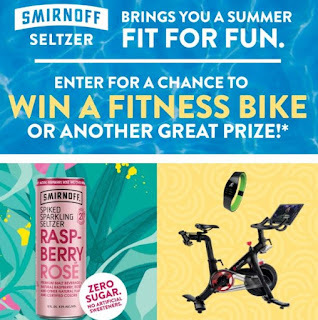 SMIRNOFF SELTZER PELOTON ® BIKE SWEEPS Official Rules. Prizes: TWENTY-THREE (23) Grand Prizes in total will be awarded. ONE (1) National Grand Prize will be awarded per week from among all eligible entries received. TEN (10) California Grand Prizes will be awarded after the conclusion of the Sweepstakes Period from among all eligible entries received from California (i.e., eligible entries which identify the winner's residence as being within the State of California and within the zip code of a certain California city/town). Winners will receive a Peloton® Fitness Bike. Approximate retail value of each Grand Prize is $2,200. FIFTY (50) National Secondary Prizes will be awarded in total (for Weeks 1 - 6 and 9 - 13, four  Secondary Prizes will be awarded; for Weeks 7 and 8, three  Secondary Prizes will be awarded). Secondary Prizes will be awarded from among all eligible entries received. Winners will receive a wearable activity tracking device. Sponsor shall determine the specific brand, model number and features of the wearable activity tracking device. Approximate retail value of each Secondary Prize is $200.